This spacious and modern penthouse condo on Victoria’s beautiful inner harbour is the perfect home-base for your stay in Victoria BC. Walk to restaurants, historic sights, and event venues in the heart of downtown, or watch the sights as you relax on the private rooftop patio. 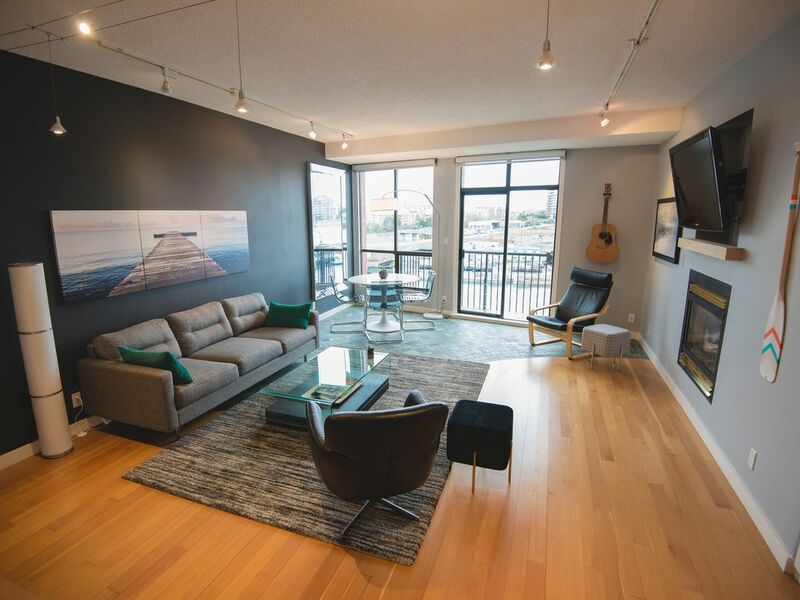 This 1 bedroom, 1 bath luxury rental comes fully equipped with stainless steel appliances, washer and dryer, new furnishings, complimentary secure underground parking, bike storage, and waterfront access. High speed internet, a flat screen TV with Telus Optik cable and Netflix are also included. There are 2 decks, one smaller one accessible from the condo itself facing west, and a large private patio on the roof that faces south toward the harbour. Adjacent to the rooftop patio is a communal area equipped with a gas barbecue. While you're enjoying your stay, you can hop on a harbour taxi, rent a kayak or grab some delicious local beer at Canoe Brewpub, all 30 seconds from your front door. Right across the nearby bridge is the Galloping Goose trail - a renowned biking and walking path. Victoria is an excellent city to explore, and this penthouse is perfectly located to make the best of your business trip or vacation. You can expect recommendations for activities, restaurants, etc. will be provided on your arrival. Air conditioning unit available for use during the summer. Kitchen has standard appliances including dishwasher, toaster, microwave and toaster oven. Dining table with 4 seats (though you can fit more). There is also a breakfast bar with 2 stools. West facing balcony accessible from within the condo. Great for watching harbour activity and sunsets. We thoroughly enjoyed our 3 month stay in this beautiful condo! The apartment was well equipped, clean, central..& Alex was very accommodating! Thanks Alex for the use of your great apartment. The view, location, cleanliness and generally all was great. The owner met us at the meeting time and was very friendly and gave all the info needed to enjoy our stay at this very nice apartment. The location is right beside Victoria’s Chinatown which is only a few blocks from the beautiful harbour. The view was fantastic, always something going on in that part of the bay. Exceeded expectations. Exactly as described. Location was perfect with proximity to downtown attractions.Condo was well equipped for eating in. Views of the activity in the inner harbour were an added bonus. Easy to recommend - or return to. Best air b&b I’ve been at. Fantastic location and wonderful unit, not sure how it could have been better! We loved our stay in the apartment in Victoria. The owner was very helpful on arrival about the apartment and the area. Parking was safe and secure. The apartment was clean and comfortable. We would definitely rent again! Great amenities and views. The Blue Bridge at night is amazing. Love the little harbour ferries - so convenient to get to the far end of town and fisherman’s wharf. Best part is just leaving the car parked - shops and restaurants within walking distance. The condo is well equipped and comfortable with ample storage to unload suitcases!